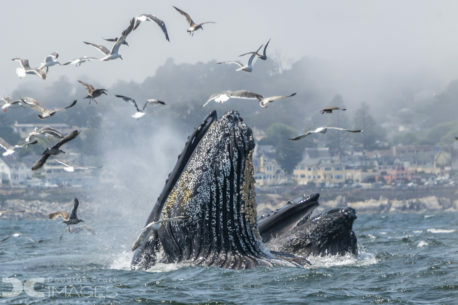 Humpback whales lunge through bait balls of anchovies trapped at the surface of the bay. Summer is an amazing time on Monterey Bay. Spring winds cause an upwelling of nutrients and that brings an explosion of life to the bay. Humpback whales, sea lions, and sea birds all congregate to feast on an abundance of schooling fish (anchovies mostly). When the anchovies school near the surface, whale watchers are treated to a real show!